The second collaboration with Mr. Mitsuta Hotta is the heavy sinking Fulcrum which is the successor of the already released Axcion. 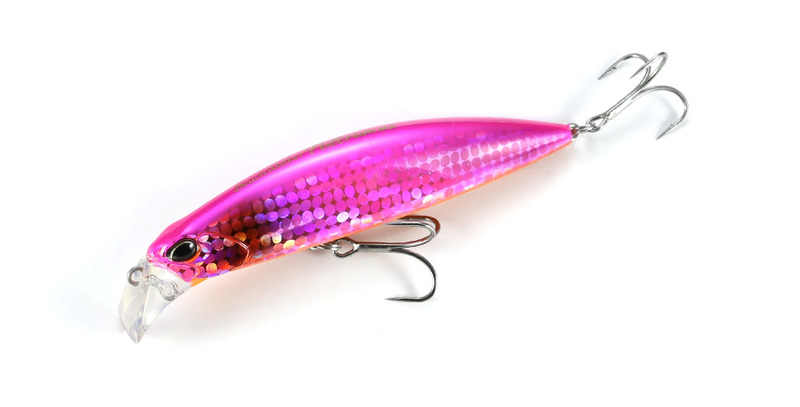 The heavy weight settings allows the lure to rocket through the air while the Bevel lip design assists the lure to grab the water. Anglers will be able to trace and maintain their target depth with this lure and feel the lure gripping the water while swimming along.? It is equipped with a strong rolling with an irregular flashing action which stimulates the Flounders feeding instincts. The strong action not only efficiently seeks the actively feeding Flounders, but its cast ability and fast sinking characteristics will also help anglers master the rip currents, deep surfs, off-shore break lines and under water structures. It will also perform to your expectations in the roughest of conditions with high seas and strong head winds.